A state-by-state review of the national elections reveals a West given over to Republicans. Idaho developers build resorts on the remains of a busted mining and timber economy. Marti Calabretta directs the cleanup of Canyon Creek, one of the most polluted tributaries of the Coeur d'Alene River. 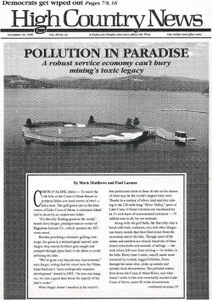 In his own words, Coeur d'Alene tribal councilman Henry SiJohn decries the pollution of a sacred place. The small but feisty Coeur d'Alene tribe has always tackled tough issues. Heavy-metal mining pollution in Idaho worries people downstream in Spokane, Wash. The next Congress will probably not solve any Western environmental problems. Election aftermath; what's wrong with this picture; corrections and emendations. Media mogul Ted Turner trades school trust lands for privacy in Montana. Small-town doctor and environmentalist Patrick Shipsey shoots 11 cows in John Day, Ore., and accidentally kills a ballot measure that would have removed cattle from polluted streams. In New Mexico, Forest Guardians and the Southwest Environmental Center succeed in winning a bid for a tract of state land on the Rio Puerco River. Westerners vote like everybody else, with just a slight Western twang.